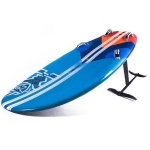 This board is special, because you can sail it or paddle it. Pair the Hoverglide FWIND1 Foil to sail in the lightest of winds. For more product details, click here.